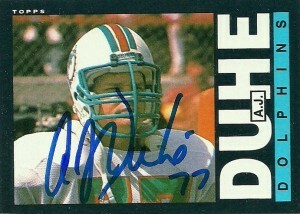 AJ Duhe was a defensive end drafted in the first round out of LSU by the Miami Dolphins with the 13th pick of the 1977 draft. His rookie campaign netted him AFC Defensive Rookie of the Year Honors that season where he started all 14 games and forced 2 fumbles, recorded 7 sacks, and 83 tackles. 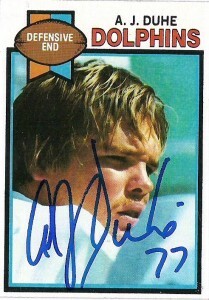 After another solid season in 1978, AJ was moved to linebacker in 1979 and played there the rest of his career. You see during that period, offensive linemen were really starting to get bigger, and Duhe was about 20 pounds too light to be at defensive end. Things paid off for him and the Dolphins by 1981 where AJ was named to the AFC All UPI team at linebacker, recording 84 tackles and 5.5 sacks. He’s probably best known for helping the Dolphins reach the 1983 Super Bowl, by making 3 interceptions against the Jets in the AFC Championship Game that season. One of his interceptions set up a crucial score and the second pick he returned for a touchdown. (In Dolphins history AJ’s Championship performance remains one of the team’s greatest single player defensive efforts in a game, outside of Jake Scott in Super Bowl VII.) Injuries over the final 18 months of his career to his knee, ankle, and shoulder finally ended it in 1984. Duhe is considered an LSU legend. Over his time at the college he averaged over 72 tackles a season and earned All SEC Honors in 1976 at defensive tackle. He makes appearances from time to time for the college to sign autographs for fans. AJ is also an avid cook and outdoor grill artist. He’s also done some small bit acting including an episode of “Miami Vice” from the 1980s.